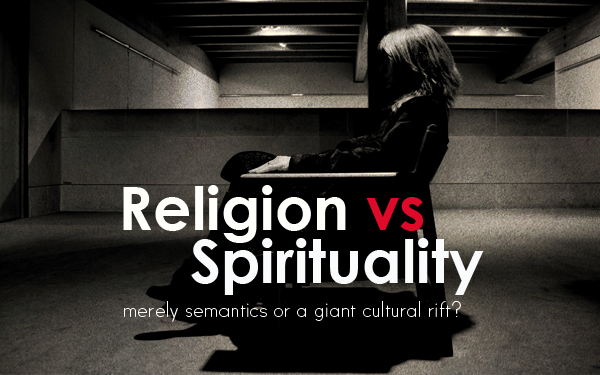 Religion versus Spirituality: merely semantics or a giant cultural rift? And judging from our brief conversation, he certainly did appear to be, on the surface at least, a “good person.”He looked more than a little rough around the edges – he had full tattoo sleeves on both arms, long hair and piercings, but he expressed respect for my position and the work I do, he spoke with affection about his wife and his kids, and he told me how he worked hard to take care of his family and live a good life. So why did his statement make me cringe? Why do I find myself reacting negatively whenever I hear people speaking ill of “religion,” while speaking positively about “spirituality”? In this case, and others like it, my reaction has much to do with the fact that a person like this is essentially fooling himself. He believes that he can be a good person (and, in the world’s eyes, he is), and he believes that “God” (whoever or whatever he, she, or it is) will accept him on that basis. When it comes right down to it, he believes that he’ll be okay with God because he has, in his mind, created a god that he can feel comfortable with – a god that doesn’t demand too much, a god that doesn’t ask for things that will take him out of his comfort zone, a god who won’t judge him. Let me put it like this by way of example: on a Sunday morning at 8:00, when you’re enjoying that pleasant drowsiness that marks the end of a good sleep after a hard week of work, when you hear the kids beginning to wind themselves up in preparation for another day of rambunctious activity, it’s a whole lot easier to be “spiritual” than it is to be “religious.” Because the “spiritual” person isn’t going to have to get the kids washed, dressed, fed, and into the vehicle before the Sunday morning service. He’s not going to have to keep those same kids under control for an hour of formal worship. He’s not going to have to spend time talking to people that he may not have much in common with, people who may annoy him or get on his nerves. He’s not going to have to listen to a preacher telling him things that he may not be interested in hearing; he’s not going to have his conscience pricked by calls to repentance. But most importantly, he’s not going to hear the gospel – the good news of salvation in Jesus Christ, salvation that comes to people because of God’s pure and beautiful grace, if only they trust in Him. And because of that, regardless of how good a person he is, if he continues on his “spiritual journey,” while avoiding the trappings of what is now known as “religion,” he will not be saved. So when I hear a non-Christian tell me that he or she is “spiritual,” and not “religious,” it frightens me. And in the faith landscape of North America, this kind of self-definition is becoming more and more common. Prejudice against organized religion, individualistic thinking, and lack of respect for any kind of authority, whether religious or otherwise, has led to this unfortunate development in our recent history. Now, seemingly in response to this shift in our culture, many Christians have begun to distance themselves from any association with “religion,” and have begun to define themselves in terms of “spirituality.” One phrase in particular keeps on rearing its (ugly) head: “Christianity is a relationship, not a religion.” “Religion,” we’re told, is a negative concept, and it has to do with outward observance of rituals and behaviours, rather than the relationship that we should have with Jesus. It sounds great, because we should all agree that the Christian faith isn’t simply about following the right rules. Being a true Christian means much more than going to church, making the requisite donations, attending Bible study or youth group or whatever church functions may have been organized. It is about living in a right relationship with God; the prophets of the Old Testament knew this, and they would write things like this: “For I desire steadfast love and not sacrifice, the knowledge of God rather than burnt offerings” (Hosea 6:6). So why should we be bothered by the phrase, “Christianity is not a religion, it’s a relationship,” if the person saying it simply means that Christianity is about more than ritual and formality and outward obedience to the moral code of the Christian community? Isn’t this just an argument over semantics? James does not say that religion is wrong. He doesn’t say that it’s superior to be “spiritual” rather than “religious.” The goal is true religion, not the absence of religion. True religion means bridling your tongue. It means visiting orphans and widows in their affliction. It means keeping oneself unstained from the world. So true religion is about much more than going through the motions; that’s clear in both the Old and New Testaments. True religion must be a religion of the heart. But the fact is, it must not stop at the heart! True religion is not simply something that happens within the person. A faithful life is not a life that’s spent contemplating the right things, having the correct feeling in one’s heart. That attitude of the heart must show itself in outward observance – in seeking to live a holy life, in serving others, in speaking in a way that comports with God’s demand for pure speech. And it must show itself even in the observance of (gasp!) ritual! But this is a false dichotomy. The Old Testament was never about the external divorced from the internal; the verse I quoted from Hosea proves that. And what’s more, the New Testament isn’t about the internal falsely separated from the external. As Christians, we still have rituals – repeated practices, done the same way again and again, that conform to a set standard. We have been given new rituals – the Lord’s Supper, and baptism – the sacraments. But we also participate in the old rituals – gathering together every week as a set pattern for corporate worship is a central religious ritual that we are called to honour. Ritual unexamined and done in an unthinking manner is surely a negative thing; but that doesn’t mean that ritual, the stuff that people now think of as “religious,” is negative in and of itself. Far from it! In fact, the Bible repeatedly speaks positively about these sorts of activities, and strongly encourages Christians to participate in them! And that brings me to my final concern about the religion/spirituality divide. As Christians, we are people who are called to live in community. As Reformed Christians, we speak about God’s covenant, and we speak of ourselves as God’s covenant people. One of my greatest concerns with pitting “religion” against “spirituality” is the individualistic focus of spirituality. “Spirituality” so often seems to be about my personal relationship with God, while “religion” is often associated with activities that involve corporate relationships – groups of people, doing the same things at the same time, together. In focusing on personal spirituality, as contrasted with organized religion, it often seems that the individual and his or her needs and desires becomes paramount, while the corporate aspect of our faith, which should be so central, is lost. Our religion is not just about a personal relationship with Jesus; it is about that, to be sure, but it’s so much richer than that, so much more! John puts it this way, in the introduction to his first letter: “That which we have seen and heard we proclaim also to you, so that you too may have fellowship with us; and indeed our fellowship is with the Father and with His Son Jesus Christ” (1 John 1:3). True religion is about the vertical (our relationship with God), but it also includes the horizontal (our relationships with one another). That is what we must strive for – not a vague, individualistic “spirituality,” but a true religion, a religion that defines all activities in our life, a religion that works itself out in love for our neighbour, especially in love for our brothers and sisters in the covenant community, based in our love for the Lord. It may not be catchy, but it’s true. So let’s reclaim “religion” – a Biblical word that has been much maligned – and rejoice in it, and everything that it stands for.